Ultra Brut was conceived by the now legendary Bernard de Nonancourt, who took over a near bankrupt champagne house at the end of the war with only 1000 cases in the cellar and turned it into what is now the world’s no. 3 champagne producer. Ultra Brut was conceived in 1975 to accompany the nouvelle cuisine style of food. Nouvelle cuisine with its tiny portions and large expanses of white plate has not stood the course. Ultra Brut, launched in 1981, has. And what is even more interesting – for me at least – is that de Nonancourt and his cellar master conceived the wine in homage to another ground-breaking Laurent Perrier wine. This was the Grand Vin Sans Sucre, launched for the house in London in 1889 by their London agents, Hertz and Collingwood. At that point London was not only the premier champagne-drinking city in the world but it was the city that favoured the driest of wine. Young army officers first adopted dry sparkling wine (rather than the still, highly fortified Sillery wines their fathers favoured) in the 1840s and 1850s. By the 1860s the elite fashion was for a wine that was ‘dry enough to wash your hands in’. Pommery rode that trend to drier wines very effectively right through the 1860s and 1870s but when their London agent, Adolphe Hubinet, shifted to become, in effect, Pommery’s global sales director in the 1880s the house faltered. Laurent-Perrier, though founded in 1812, really only took off when Eugène Laurent and his wife Mathilde Emilie Perrier (a remarkably good-looking couple) inherited the Le Roy Fils & Pierlot house, where he had been cellar master. Mathilde was the driving force before and after her husband’s death and she launched the Veuve Laurent-Perrier brand in 1887, and the Grand Vin Sans Sucre in 1889. As its name suggests this was a wine entirely without sugar – a daring innovation that depended on the ability to source great grapes in good years and to allow the wine time to age. But that was not the only innovation. Hertz & Collingwood, the London agents, embarked on an extensive advertising campaign in the British press for their unique wine. Until that point, the only advertisements in the British press were small, text-based (closer to today’s small ads than anything we would recognise as display advertising) and gave only the merest details of brand name, price and stockist. Nothing about the wine itself. Not so, the Sans Sucre. 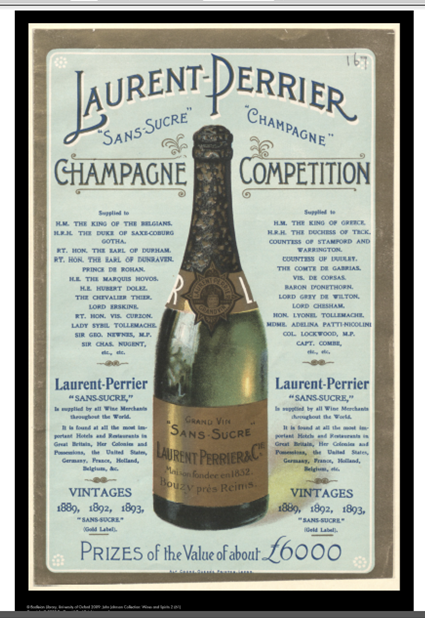 More than just the endorsements and the medical plug, Laurent-Perrier also started a process with their ads of trying to define the nature of the wine. Their positioning copy steadily evolved from the original ‘absolutely sugar-free’ line to a positioning based around the only ‘Natural Champagne to which nothing has been added’; thereby attacking other wines which, they claimed, had both added sugar and added alcohol (common at the time). Later in the 1890s they broke further new ground with a promotion aimed at women – note the jewellery prizes – rather than men; the first time this audience had been identified and targeted. The promotion was probably not a great success In England, though it’s impossible to be sure since there are no extant sales figures. In France, it became a staple of grand restaurants such as the Jules Verne in the Eiffel Tower until 1913. Laurent-Perrier, the company, was largely becalmed between the wars. It took de Nonancourt to revitalise it – and bring back the Sans Sucre, this time as the Ultra Brut.